Procter & Gamble (NYSE:PG) and Coca-Cola (NYSE:KO) are widely known as two of the most stable companies on the stock market today. And with decades of growing dividends, they both qualify as Dividend Aristocrats. They're also old guards in business, making consumer goods that face immense competition from technology advancements and smaller, more nimble competitors. Amid all of the change in the market, the question is: Is Procter & Gamble or Coca-Cola the better-positioned company in the long term? The internet and new retail trends have changed the position both companies hold in retail. Retailers like Amazon have allowed smaller brands to have equal standing to Coca-Cola and P&G and allowed much broader geographic reach than would normally have been possible. Trends toward healthier, customized, and locally made consumer products have also hurt the growth prospects for both companies. 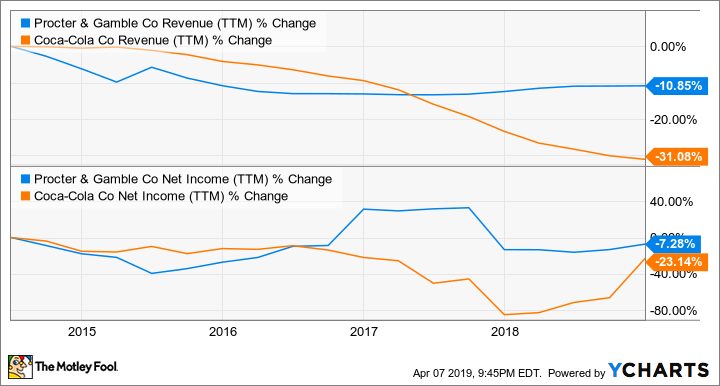 You can see below that over the last five years, they've both posted shrinking revenue, partly due to asset sales but also because existing operations aren't growing steadily like they used to. Which will be able to adapt to the new consumer world? I think Procter & Gamble is the company positioned better strategically. Brands like Pampers, Old Spice, and Tide engender a high amount of brand loyalty and there's a cost advantage in creating those products at the scale of a major manufacturer. I think Coca-Cola is more likely to face localized competition in the drink market as tastes change and customers see little advantage of buying from an international brand over a healthier option or a local upstart. 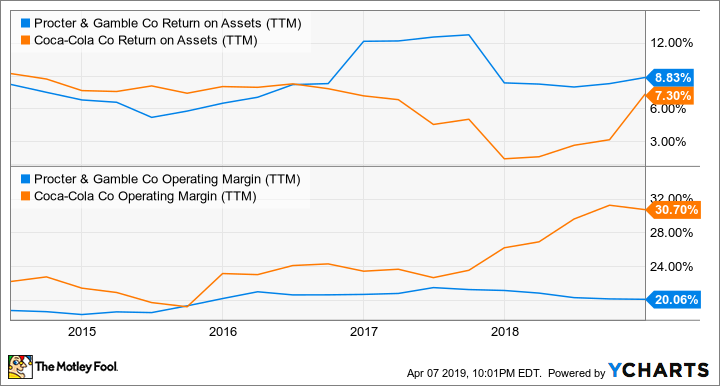 You can see below that over the last two years, P&G has generated a higher return on assets, despite slightly lower operating margin. The rise in Coca-Cola's operating margin is a bit deceptive because it aligns with the company selling bottling companies, which are low margin. PG Return on Assets (TTM) data by YCharts. As far as value goes, there's no clear winner between P&G and Coca-Cola. 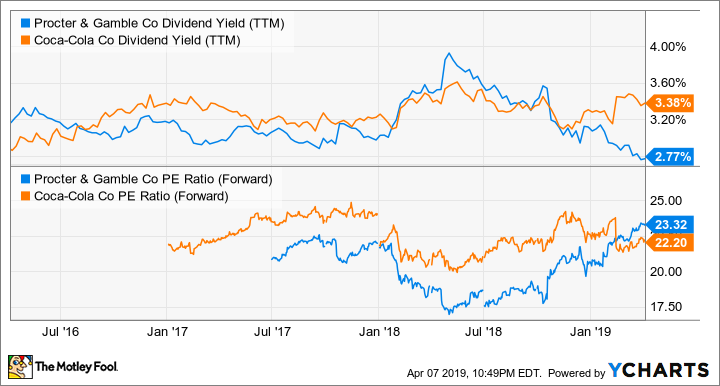 You can see below that their forward earnings ratios are about the same, although Coca-Cola's yield is higher. I don't think the traditional value numbers are particularly meaningful for these stocks given the disruption taking place in consumer goods. Instead, what separates these companies is their strategic position in the market. In that respect, I think Procter & Gamble has a clear advantage, and that's why I think it's the better stock to own today.